Throughout my leadership journey, I’ve had many opportunities to study history, thanks to many of the Leaders in LIFE who understand the importance of learning history. It’s been said that “those who don’t learn from history, are doomed to repeat it”. Iv’e also heard many times that “the lesson is repeated until the lesson is learned”. How true on both accounts! 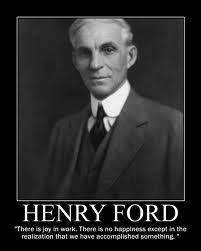 One of my favorite historical leaders to read about is Henry Ford. Even though I wasn’t much of a history nut as a kid, something about Henry Ford’s involvement with automobiles, always interested me. I quickly learned that Henry Ford did not invent the automobile. He didn’t even invent the assembly line. But more than any other single individual, he was responsible for transforming the automobile from an invention of unknown utility into an innovation that profoundly shaped the 20th century and continues to affect our lives today. Innovators change things. They take new ideas, sometimes their own, sometimes other people’s, and develop and promote those ideas until they become an accepted part of daily life. Innovation requires self-confidence, a taste for taking risks, leadership ability and a vision of what the future should be. Henry Ford had all these characteristics, but it took him many years to develop all of them fully. As a child, he was inspired by his mother, who encouraged his interest in tinkering. His father was a farmer. He encouraged Henry’s interest in the use of machines on the farm. He was inspired by steam-powered tractors when he was a teenager. This made him think about the way things work. He was fired from his first job. Henry built his first gasoline engine at home and tested it in the kitchen. He mounted it on the kitchen sink. Thomas Edison was Henry Ford’s role model and later his close friend. He built and drove race cars early in his career to demonstrate that his engineering designs produced reliable vehicles. He failed with his first two companies before he succeeded with Ford Motor Company. The idea for using a moving assembly line for car production came from the meat-packing industry. He financed a pacifist expedition to Europe during WWI. He adopted a paternalistic policy to reform his workers’ lives both at home and at work. He was an unsuccessful candidate for the United States Senate in 1918. He owned a controversial newspaper, The Dearborn Independent, that published anti-Jewish articles which offended many and tarnished his image. He promoted the early use of aviation technology. Henry Ford built Village Industries, small factories in rural Michigan, where people could work and farm during different seasons, thereby bridging the urban and rural experience. He sought ways to use agricultural products in industrial production, including soybean-based plastic automobile components such as this experimental automobile trunk. He was one of the nation’s foremost opponents of labor unions in the 1930s and was the last automobile manufacturer to unionize his work force. Ford mobilized his factories for the war effort and produced bombers, Jeeps, and tanks for World War II. He established schools in several areas of the country that provided educational experiences based on traditional one room school techniques, modern teaching methods, and “learning through doing”. He established an indoor/outdoor museum–The Henry Ford–to preserve historical items that illustrated the American experience and American ingenuity. Wow, that was probably more than most people cared to know, but interesting none the less. However, there are some great leadership lessons to be learned and applied from Henry Ford’s life. His timeless quotes can inspire and motivate everyone to accomplish great things. Here are some of his quotes to aid you on your leadership journey. Enjoy! There are no dead ends. There is always a way out. What you learn in one failure you utilize in your next success. Education is not something to prepare you for life; it is a continuous part of life. All that I personally own of any value is my experience, and that cannot be taken away. One should not complain of having one’s fund of experience added to. My best friend is the one who brings out the best in me..
Don’t find fault, find a remedy..
You say I started out with practically nothing, but that isn’t correct. We all start with all there is. It’s how we use it that makes things possible. The greatest thing we can produce is character. Everything else can be taken away from us. One of the greatest discoveries a man makes, one of his surprise, is to find he can do what he was afraid he couldn’t do. You can take my factories, burn up my buildings, but give me my people and I’ll build the business right back again. What I greatly hope for these children, and for children everywhere, is a new attitude toward life – free from the gullibility which thinks we can get something for nothing; free from the greed which thinks any permanent good can come of overreaching others. You will find men who want to be carried on the shoulders of others, who think that the world owes them a living. They don’t seem to see that we must all lift together and pull the weight. The genius of the American people is self-reliance. The old principles that made us great – self-direction and self-help – are still contemporary and valid.